The Titans opened with an early field goal by Ryan Succop, but the the Chiefs would respond with two touchdowns, one a QB Patrick Mahomes touchdown pass and the other a punt return for a touchdown by WR Jehu Chesson. The Chiefs would extend their lead with a QB Joel Stave touchdown pass to WR Tevin Jones. Kansas City went on to win the game 30-6. With that, we give you our PFF exclusive takeaways from the contest for each team. The first-round pick got the start on the night and was electrifying from the first snap. 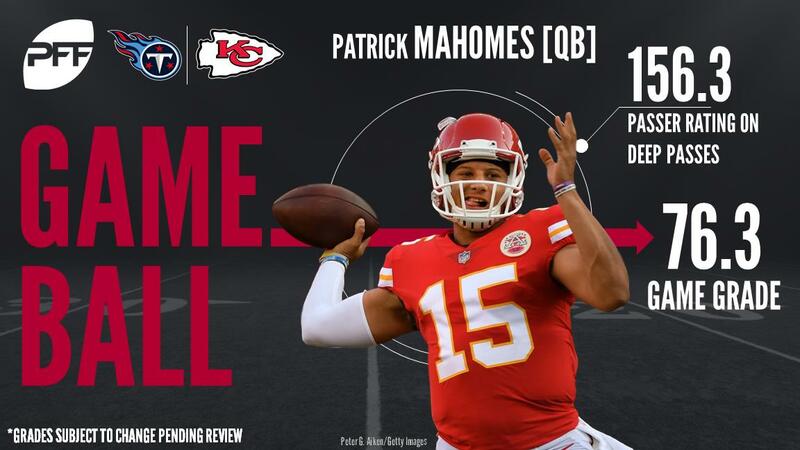 Mahomes flashed the big-play ability each drive, finishing with 183 yards on just 16 attempts good for an 11.4 yards per attempt mark. Mahomes had passing plays 53, 46, and a 28-yard TD to Demarcus Robinson to cap off the preseason. Robinson showed good rapport with Mahomes all night and was on the receiving end of all the explosive plays in the passing game while Mahomes was in the game. Robinson averaged 42.3 yards per catch on his big night on 3 receptions and a TD. Eligwe was active in the run game and pass game on his 35 snaps. On the night he totaled 6 tackles, 2 stops and allowed just 1 catch for 3 yards while in pass defense. Jenkins was the Chiefs second-highest graded defensive player with an extremely productive night against the run and pass. He finished with a quarterback hit as well as a hurry when rushing the passer, and 2 tackles and 2 stops against the run. Tanney played the majority of the snaps for the Titans and continued his preseason struggles. When facing a clean pocket with no pressure, Tanney was 8 for 18 for 82 yards 0 TD’s 1 INT and a 35.0 passer rating. Fluellen was given the opportunity to carry the load and produced mixed results, although he was the Titans most productive skill player on the evening. Of his 74 yards on 19 carries, 53 yards came after contact, but was able to have a long run of just 9 yards. The interior part of the defense was the lone bright spot for the Titans on the night. Brown was a big part of slowing down the rushing attack, totaling 2 tackles and 3 stops while also posting a sack. Much like his counterpart Brown, Blackson helped control the middle of the defense that limited the Chiefs rushing attack to just 2.5 yards per attempt on 27 carries. Blackson got to the passer with a hit, to go along with one tackle, two assists, and one stop.